And two things happened to me simultaneously: I snorted my beverage out my nose, and put this show on my calendar immediately. See, I practically cried when House went off the air. I loved that show. In all its formulaic glory, as often as the diagnosis of sarcoidosis was bandied around (apparently that can cause any symptom on earth), and as doofy as it ever became, it deeply satisfied my desire to solve stuff and to see order resolving out of chaos and also, when it was funny it was really, really funny, and when it got genuinely dramatic that often worked, too. So I was down for The Good Doctor, which is completely and utterly novel in that it is an episodic medical drama that focuses on a brilliant but emotionally and communication-impaired doctor at a hospital near a prestigious university, who is savantic and sees things other people don’t see, but as indispensable as he is, he has a hard time in his personal life because other people find him difficult to deal with, and he has a hospital administrator who’s in his corner and various young doctors who dislike him but find him compelling and are in secret relationships and are attractive and have British or British-influenced accents. Because, dudes: That is so different from House. Congrats on the groundbreaking high concept, ABC. Let me say right now that a couple of performers are so compelling that I’ll probably watch a few more episodes and see where it’s going. Dr. Shaun Murphy (Freddie Highmore) and his mentor-champion Dr. Aaron Glassman (Richard Schiff) are amazeballs. Seriously. Mega-snaps to both of those guys. While I have some quibbles (and bigger than quibbles) about the way Murphy’s autism manifests (and is handled conceptually), the actual performance by the actual Freddie Highmore is striking and compelling and applause-worthy, and Schiff is a delight, with his signature world-weary sardonic gravitas thing in full flow. Many of the more peripheral characters are also turning in good to really good performances, but those two especially are to be commended for what they manage to do with this script. Now, let’s talk about the script. I was only able to preview the pilot episode, and sometimes a show with a crappy pilot rights itself and goes on to be a well-oiled machine with a confident voice and epic strength by the end of the season, and this show certainly has the potential to do that. Unfortunately, some serious missteps are going on here, and folks with limited patience might justifiably get crotchety about giving this puppy a second chance. Logic Alert: The entire episode is framed by a board meeting in which the contentious politicians on the hospital’s governing body argue over whether it is OK to hire an autistic surgeon. Who has already been hired and is en route to the hospital for his first day of work when, of course, he is delayed by a terrible life-threatening random injury to a small boy, whose life he saves, except maybe not, because complications… eek! The suspense. Actually, the suspense is seriously fractured by this really intrusive board meeting, in which Aaron Glassman delivers impassioned apologias on Murphy’s behalf while a roomful of people who (A) should know better and (B) should have way-big-seriously already have duked this out before the kid was on his way from Wyoming carrying all his possessions. Yo, Saint Bonaventure Hospital Board: If any of y’all had watched House, you’d know that being on the spectrum makes you an incredible diagnostician, not a liability! Also: When was the law passed that surgeons must be able to demonstrate “empathy?” They’re actually pretty famous for being cold fish who prefer to deal with people who have been knocked senseless and can’t talk back. Also, p.s., people on the spectrum inhabit the corridors of every medical facility on the planet. We are not adjudicating Brown v. Board of Education here. Yikes. Pacing Alert: As a result of the choice to set up the pilot as a bicker-fest over whether an autistic man can be a surgeon while a young boy’s life unnecessarily hangs in the balance because nobody listens to Freddie Highmore, the script has an unfortunately virulent case of Ponderous Flashback Disorder, and moments that should be taut, red-hot wires in the real-time narrative are invariably interrupted so we can dive into Dr. Murphy’s head and witness all the moments that led him to become a surgeon. These could have been spooled out over many episodes. They could, in fact, have not been left out entirely, and I’d have voted for that if I were writing for the show not just because of the hit pacing takes, but for the sake of character integrity. I’m the first person to say it’s wrong to assume autistic people are all autistic in the same way, but the diagnosis is based on some signature tendencies, and one of them happens to be impaired autobiographical memory! If you are autistic, the odds are really good that you have amazing declarative memory (for example, being able to recall vast numbers of facts) but impaired psychological self-concept and thus a tendency to have less autobiographical memory than non-autistic people. So, the choice to have this guy dwell so deeply in a world of subjective autobiographical memories, and to associate strong emotions with them, is… one that arguably requires a lot more justification than Dr. Glassman’s desire to hire him. (It’d be a clear choice for a protagonist with PTSD.) But even accepting it as proper to this character, the flashback rate is high enough to trigger the “Wow, these writers don’t trust their audience to follow a story” tripwire more than once. Unreconstructed Sentimentality Alert: Part of what made House tick was the mordant, acerbic, dirty-martini-dry wit of the chemically potent ensemble cast. Hugh Laurie was an A+ misanthrope with a through-the-roof IQ and a lot of deep and staunchly defended misery, pain and depression. And the people forced to deal with him had a range of strategies, from howlingly funny to misty-eyed sad, that snapped together like a jigsaw puzzle. 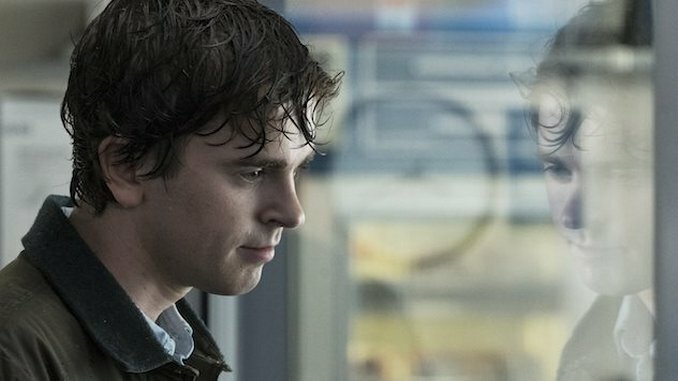 Chemistry takes time to develop, and again, maybe a few more episodes of The Good Doctor will see the development of some intriguing chemistry. So far there is exactly none. What there is, is sentimentality—and lots of it. From Glassman’s lachrymose and valedictory speeches about Why It Is Right to Hire the Autistic Guy to Murphy’s flashbacks into a childhood worthy of Dickens to the radical, 180-degree flip from angrily against to tearful-ovation-grade for this character, the script relentlessly jerks us around by our heartstrings. I’ll refrain from spoiling, but if you watch the pilot you’ll see what I mean. Last But Not Least, “Very Special Episode” Alert: I am not personally on the spectrum, but I have family members who are on the spectrum. I have friends who are on the spectrum, friends with kids who are on the spectrum, including at least one actual savant. I am not an authority on the subject, nor do I think having a child, sibling, parent or great-uncle who is autistic makes anyone an autism expert, although you are indisputably well-versed in the ways of the particular individuals in your family and close circle of tribesmen. So I’m going to go ahead and refuse to issue any “Thou shalts” or “Shalt nots” where the characterization of autism is concerned. I do not dispute Dr. Shaun Murphy’s right to be any flavor, stripe, riff or variant sort of Person With Autism. It’s a wide range of stuff, and in fiction, anyone can be anything, provided there is an internal coherence and logic to it. Because fiction is a work of imagination and stuff. What bothers me isn’t how this character is autistic. It’s the way a bunch of trained physicians react to him that gets the hairs on my arms kind of stand-uppy. The pilot episode of The Good Doctor presents us with a world where autism is both more and less of a thing than it should be. That board meeting is way too much of a referendum on the theoretical prospects of an autistic person and way too little of an evaluation of a new hire. And Murphy’s regression into child-speak as he describes the life events (which we already saw through his eyes in flashback) that made him want to be a doctor, and the weepy, go-you-comma-tough-guy response it gets from a roomful of pointlessly hostile people? It’s fricking manipulative and we’re not in need of a manipulation around this issue, are we? If Dr. Murphy were presented as someone whose autism caused him certain problems and solved others but was not subjected to a grand jury the second the title sequence was over, if he’d been willingly embraced, for example, by all or most of his supervisors and then left to cope with whatever issues arose for him when there was a high stakes medical situation and words stopped working for him? That would have been a smart way to frame the character arc. But that’s not what they did. If I sound like I’m indicting this show, I need to say it again: I have only seen the pilot. There are plenty of shows that take a few episodes to find their groove, and that is okay. Maybe this will be one of them: The raw material is there. More than there. It’s not groundbreaking: It’s a thoroughly proven formula. The only required inputs are good storylines and good ensemble chemistry. I hope the writers and showrunners find it in themselves to trust their audience to handle subtlety. So far it ain’t lookin’ likely, but if the pilot episode makes one successful point, it’s that first impressions can be deceptive. The Good Doctor premieres tonight at 10 p.m. on ABC.